Urucum is an intense and rich dish using fresh fish from the Brazilian Pantenal. Local dishes in Brazil’s western flood plain- the Pantenal utilises a whole host of rivers that are teeming with a wide variety and large volume of fish, especially after the breeding season. As such river fish is on the menu in Corumba and all over the Pantenal where we found this dish. 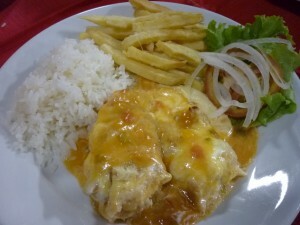 We did enjoy this dish for sure but think that it is perhaps too rich, but the Brazilians enjoy rich food with plenty of cream, butter and cheese so who are we to argue? This is all about what other people eat after all! What is fascinating about Brazilian Urucum is the red colouring that is added. Urucum takes its name from a plant that produces a pod of red seeds and is used in cooking as well as tribal decoration in the Amazon rain forest. The colouring does almost nothing in terms of flavour, but usually adds a warm orange tint to the otherwise stark yellow colour you get from the cheese. This dish funnily enough does not use Urucum as it originates from the Pantenal, but to achieve this the dish uses tomato and red pepper to deliver the same colour. How: First finely chop (as small as physically possible until it is almost a paste) the pepper and onion. Cut the tomatoes in half. Fry all of this in a little oil on a medium heat with the lid on for 5 minutes until they begin to soften and the tomato skins begin peeling away. Peel the skin off the tomatoes, remove the seeds and then finely chop as small as possible as you did for the onion and pepper, or you can put it in a blender until it is smooth. Return the tomato, onion and pepper to the pan, place over a low-medium heat and add half the butter. When the butter has melted add the flour and stir continuously for 5 minutes until the flour glues together and turns into a solid mass. Slowly add the water as you continue to stir. This will stop any lumps forming. Once the water has been used reduce to a low heat and add add the salt and pepper. To finish the sauce slowly add the coconut cream and then the double cream using the same method, while stirring regularly to ensure the cream incorporates into the sauce. Around 5 minutes before all the cream has been added to the sauce add another pan with the remaining butter to a medium heat. When the butter is bubbling hot add the fish. Cook the fish for 3 minutes on each side so it is half cooked. Remove the fish from the pan and place it on a baking tray. Sprinkle the cheese carefully over the fish to cover it evenly. Grill the fish and melt the cheese under a very hot grill for 3 minutes. Remove the fish and serve on a plate. Pour enough of the sauce over the fish to ensure it is completely covered but not swamped. Serve Urucum with a salad garnish and French fries.